At Superior Cheer, our passion is making sure our customers look and feel their absolute best, while assisting them from start to finish! Our friendly Sales Representatives work with our customers to select the perfect uniforms, shoes, poms, and accessories to fit their team's style and budget! Superior Cheer has been operating since 2011 — however, we have been serving the dance community for over 20 years! As a division of Pearison Inc., we have supplied uniforms, footwear, and poms for local groups, as well as teams across the country. We carry top brands like Adidas, Asics, Nfinity, Dehen, And More! Along with our Band Shoppe Catalog and website, Pearison Inc. also produces a 134-page cheer catalog and e-commerce website in-house with our fully staffed department of Graphic Designers. Each item in our catalog is carefully selected to meet our customer's needs while considering quality and price. Superior Cheer also has full-color sketches along with price quotes offered free of charge. Superior Cheer is proud to partner with Dehen and Motionwear to make all of our custom cheerleading uniforms sewn and decorated in the USA ensuring a high-quality product. Not just uniforms, Superior Cheer's entire line of spirit flags and battle flags, banners, poms, and hair bows are all Made in the USA! 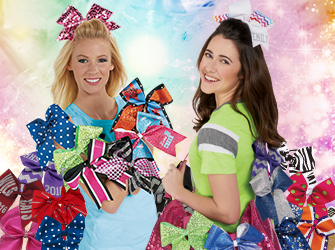 In addition to our great selection of in stock and custom uniforms, cheer shoes, poms, warm-ups and team wear, and spirit accessories – Superior Cheer also has the largest selection of bows in the industry! And our cheer bows are always Made in the USA. From head to toe Superior Cheer has it all!